Serving Bernalillo, Valencia counties and surrounding areas. Is an innovative, affordable cabinet refinishing service that renews & restores your wood cabinets more affordably and faster than traditional cabinet restoration services. Classic Cabinet RefinishingThis option is for minimal cabinet wear with no color change or shift. Dirt & grease are removed and touch-up work is applied. Cabinet ColoringOur line of custom Custom Colors give you the new trend of white or colored kitchen cabinets you have been looking for. Our unique and specialized N-Hance refinishing process will extend the life and luster of your cabinets for years to come. For each job, we thoroughly clean the surface of your cabinets, remove old coatings, repair damaged areas and apply an elegant finish. All with less mess of traditional cabinet refinishing methods. Check out our one minute video on how our N-Hance Cabinet Color change process works. If you love your old cabinets but they are beginning to look worn from years and years of use, our N-Hance cabinet renewal is a great option. 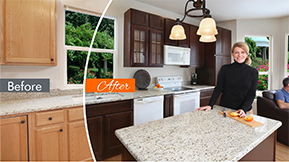 We can revitalize the look of your cabinets without the frustrations of typical wood refinishing at a fraction of the cost of traditional methods – with most jobs complete in just one or two days. This process will extend the life and luster of your cabinets for years to come. 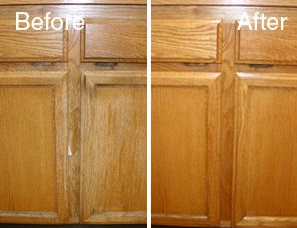 Our Basic Cabinet Renewal job requires no color shift or color change and has minimal wear on the wood surface. Grease and dirt are easily removed and touch-up is performed quickly. You will love the shine and luster this service brings to your tired cabinets. There is no dust, mess or odor and in many cases the job can be completed in just one day. The N-Hance renewal process thoroughly cleans the surface, repairs damaged areas with less mess and applies an elegant finish. You will love the brilliant results. 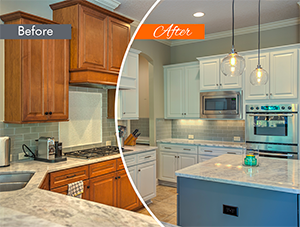 Rethink Refinishing ® with a complete cabinet Color Change. This process involves a much more dramatic effect than the other cabinet services such as traditional refinishing, refacing or even replacement. Often the change will involve going from a golden oak or whitewash finish to a cherry, walnut or black tone. You will love the result of this transformation. The darker, natural tones and the clarity of the wood grain offers a completely new look while retaining the beauty of the natural wood. It’s a great way to give your kitchen a new look and change the entire feel of a room. The Cabinet Color Change typically takes 3-5 days to complete. Ready for a white kitchen? Do you like gray or blue? With our opaque color change you can pick any color, or combination of colors you like. Our proprietary process is much more durable than paint and offers a clean, drip free, factory-like smooth finish. Our products are made especially for cabinets and will offer years of durable beauty to completely change the look of your cabinets. Let your imagination run wild with this option. Over time your floors may appear to be in such bad condition that they need to be completely replaced or sanded down. They may have separated or suffered color loss due to traffic wear patterns or sun fading. We can repair or disguise much of the damaged areas and restore that original life and luster to your floors. 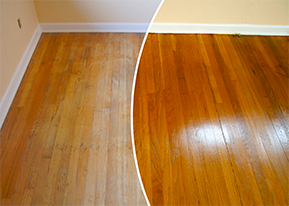 Our revolutionary wood floor refinishing can restore your floors to their original beauty in your home or business. I had the kitchen cabinets refinished and they did an outstanding job. The end result appears better than the original finish. Best part is that these folks are professional in every aspect. They are punctual, friendly, courteous, and helpful. Very well run company. I wouldn't hesitate to recommend them. I chose to use N-Hance based on the fact that they are a local family owned business. It was the best decision! From the time I booked an estimate, until the work was completed, I was super pleased. You deal directly with the family, and they do the work, not sub-contractors. Not only were they punctual, to the minute, but very professional, respectful of my home, took pride in their workmanship, but Jeff is a perfectionist! And I loved the fact that my home would not be dusty, and it wasn't! I’m so happy that I found you guys. My cabinets looks fantastic and it didn’t cost me as much financially or in time. My kitchen is my castle and I couldn’t be happier. Our family loves the look and feel of our refinished cabinets. Thank-you so much for a job well done. Are You Ready to Get Learn More? or complete the web form to schedule your Free In-Home Estimate.